Amanda, I LOVE this … right after my own heart! I love reusing items from around the house (or DH's work) to make awesome, workable items. Awesome! I am a guest blogger at Sew Dang Cute today where Tam is hosting the second round of Crafting with the Stars! Come on over and see what I made and what the contestants have put together. 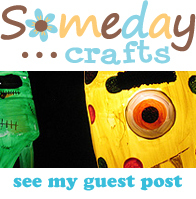 I am guest posting today over at Michelle’s fabulous blog, Someday Crafts! « Winner of the Silhouette Giveaway!